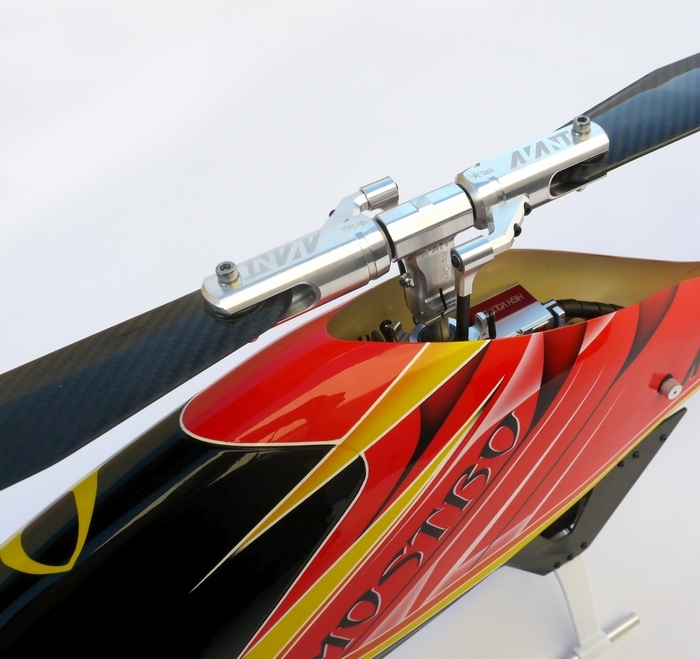 We’re happy to announce that the Mostro 700 Nitro has been released. 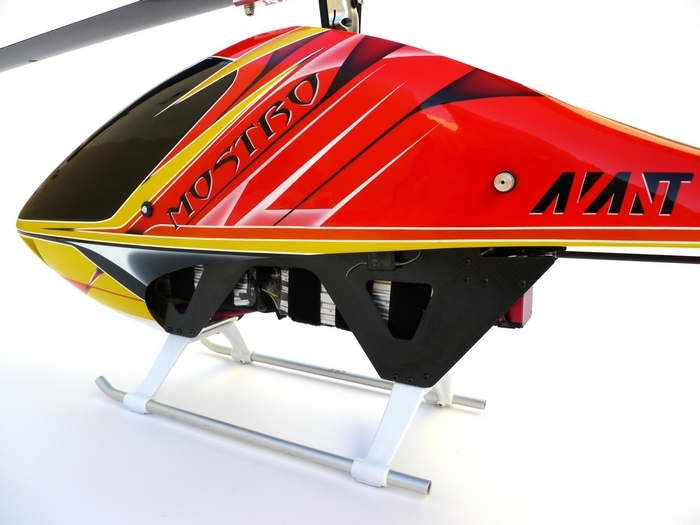 This is the most advanced Nitro in the Market and it’s the only one that incorporates the latest design techniques into a Nitro model. 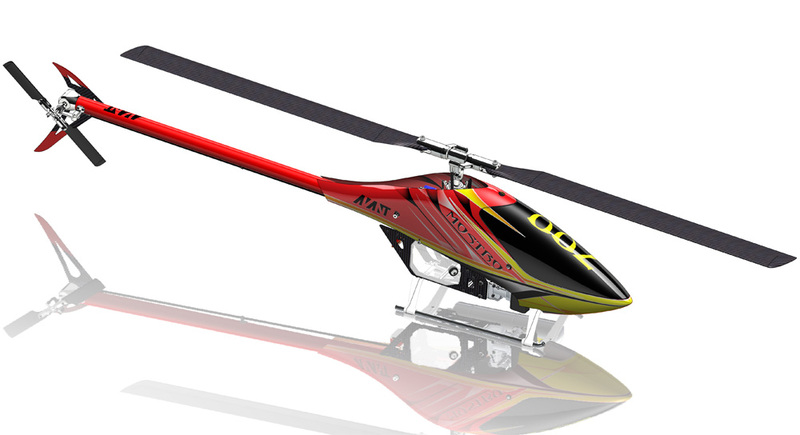 Nitro pilots no longer need to feel left out of the new wave of RC Helicopter design because they now have not just a new Nitro but the most advanced Nitro ever built available. 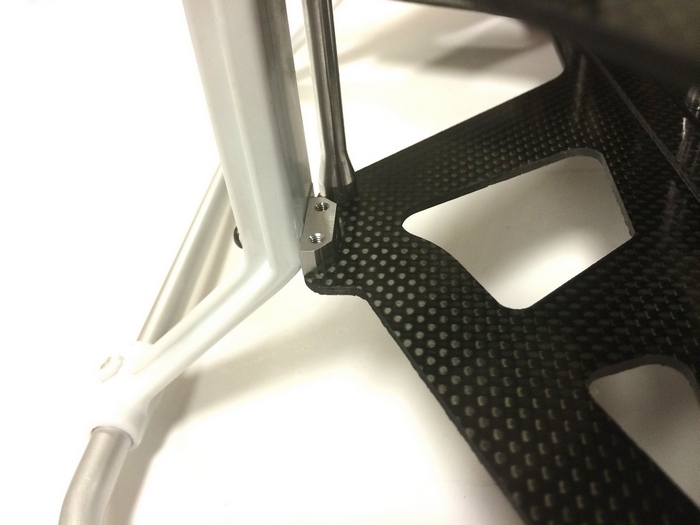 Based on customer’s feedback we decided to make a new landing gear mold to widen the landing gear. 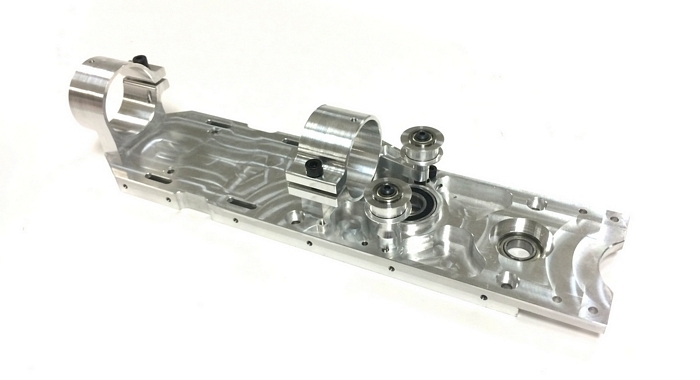 The part will be shipping the week after next and will be available as an spare part and in future kits. 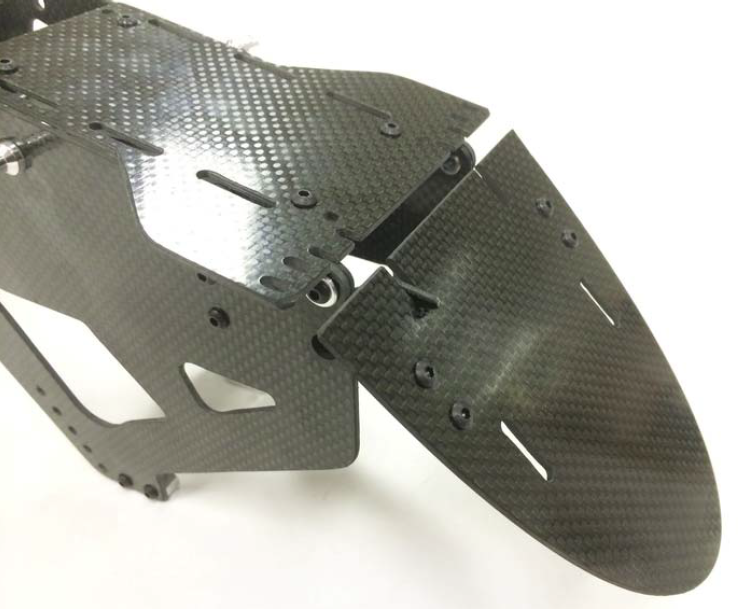 Notice also that we made a new version of the frames for an even lower profile. The Landing gear now partially hides inside the canopy. 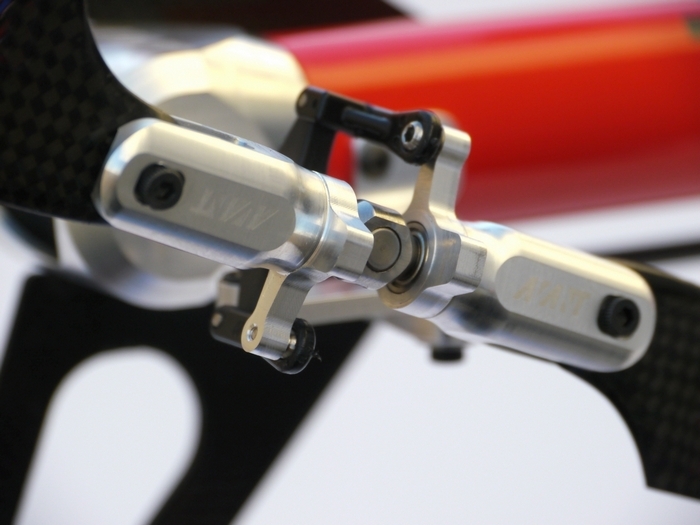 The lower stance frame is a drop-in replacement for the original one and is currently shipping as the standard kit frame in all kits. 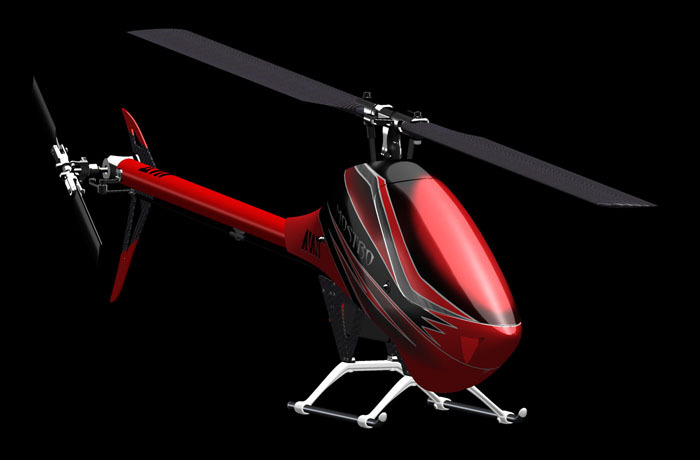 This is the red version of a new color scheme available as an optional set. There is also a neon yellow version pictured below. 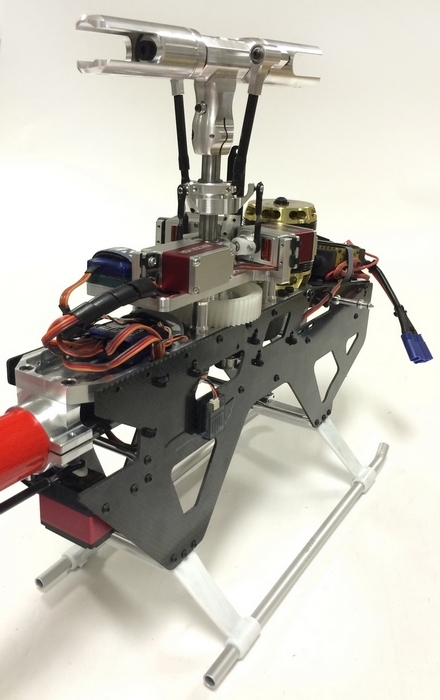 This version is being previewed in the new Mostro Nitro introduced at the IRCHA 2014 event. 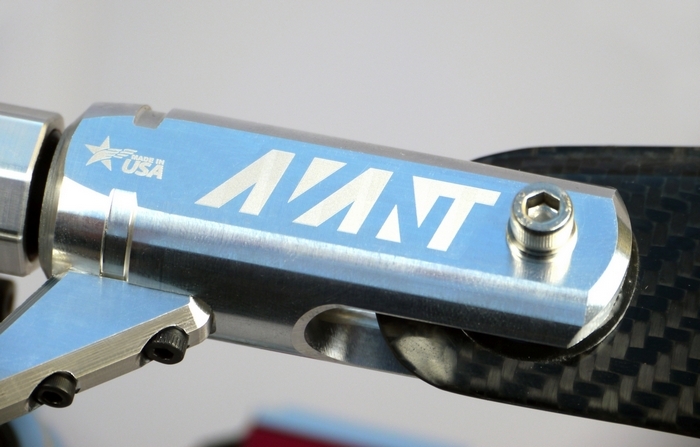 The new color schemes will be available as optional parts. 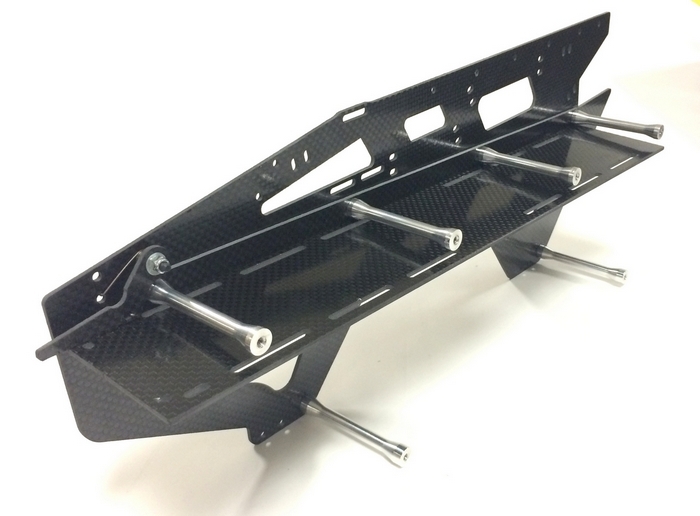 Kits will ship with the original canopies. 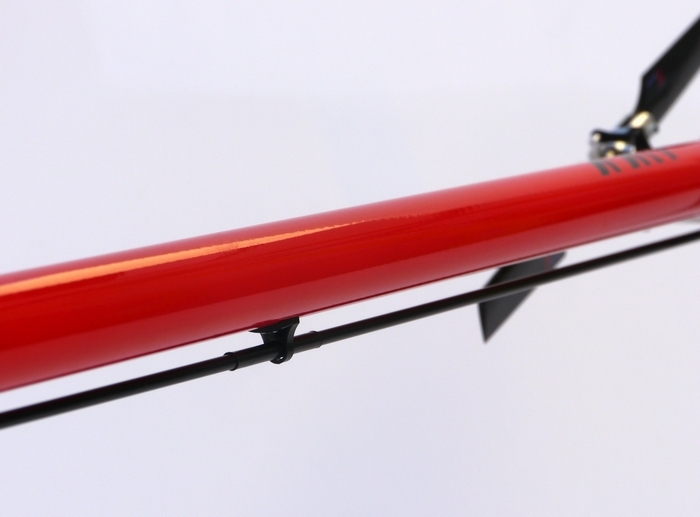 The red scheme uses the same red boom and fin used in the original kit so only the canopy is different. 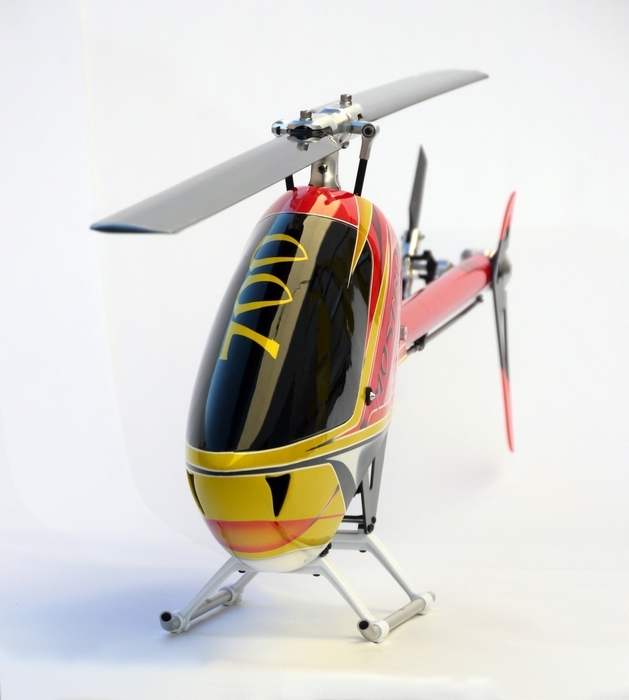 Factory Pilot Jason Bell flies a Mostro at the 2014 San Diego FunFly. 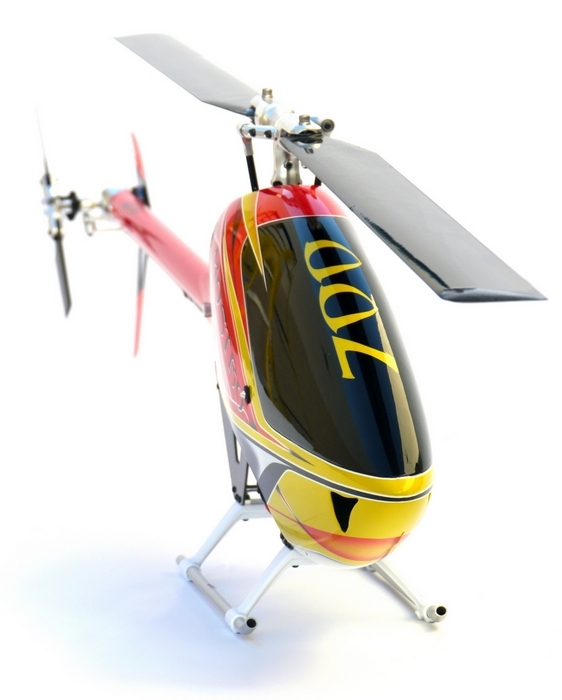 We’re happy to announce that the Mostro e700 is shipping worldwide. People all over the world are receiving their Mostro kits and posting pictures and videos on Facebook, YouTube and online forums and the response has been overwhelmingly positive. 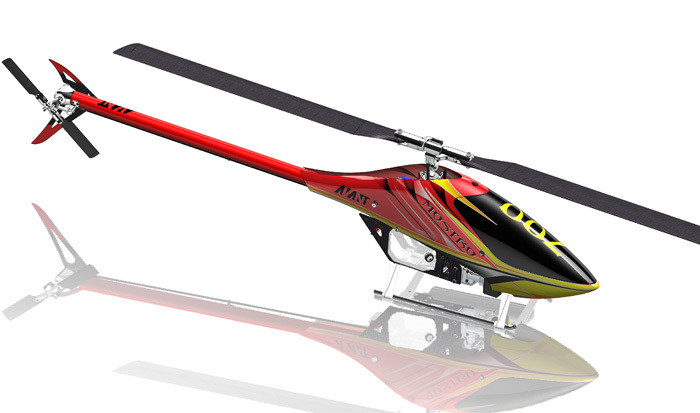 We are very happy that all our work paid off with the result in the best helicopter kit in the market by far. 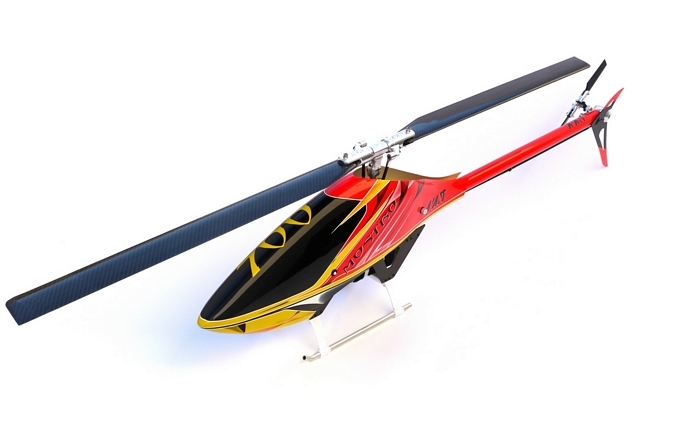 Hope you enjoy your new Mostro helicopter as much as we do ourselves. 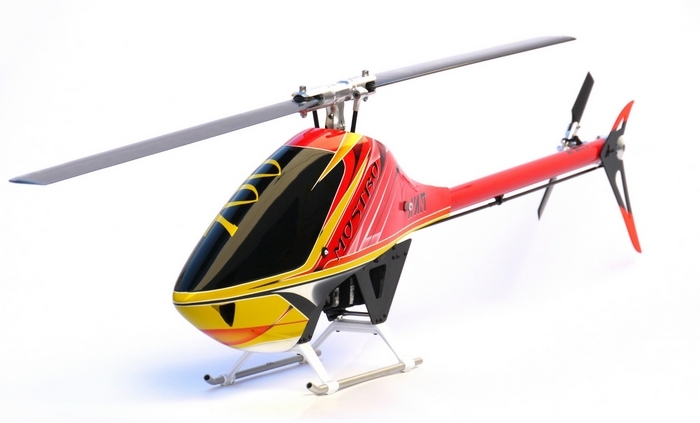 The most advanced 700-sized helicopter in the market is available now. 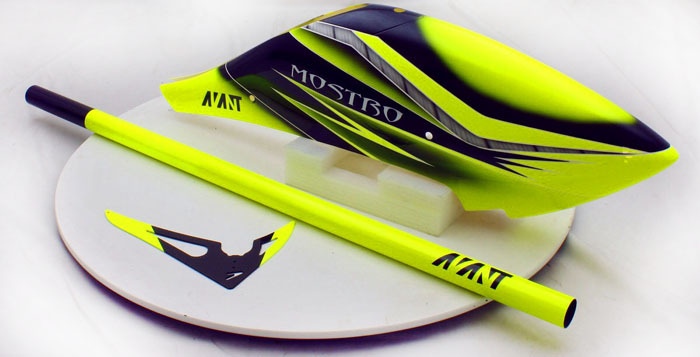 The Mostro 700 electric RC Helicopter by Avant RC. 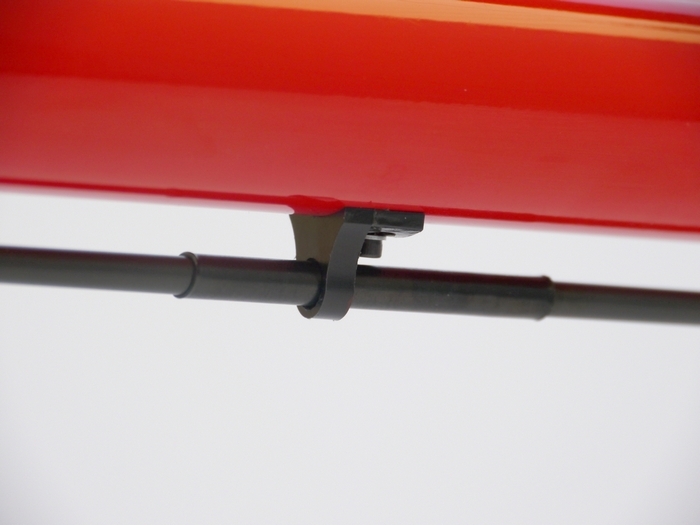 Tail Pushrod Guide view. 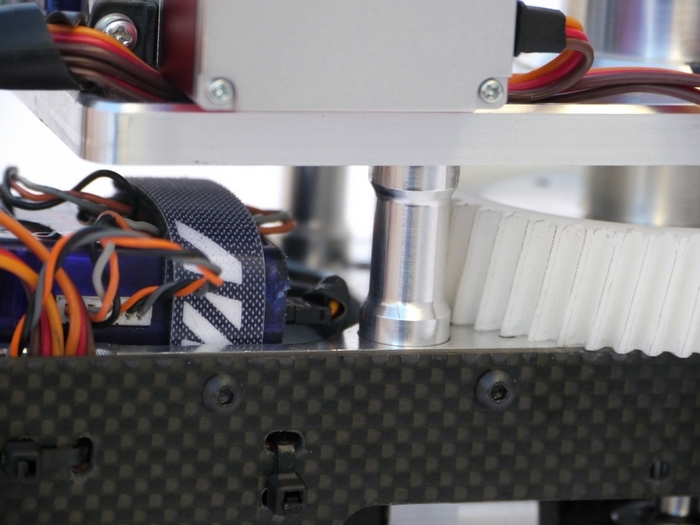 Notice the adjustability to allow to adapt for either side of servo mounting. 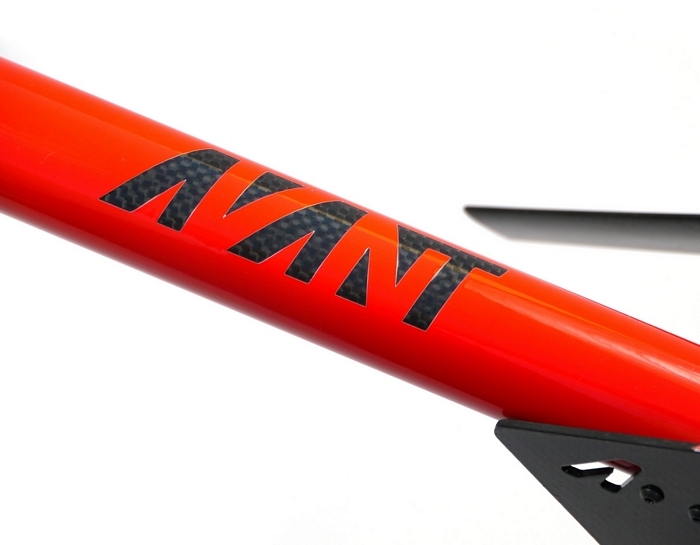 Tail blade grip view. 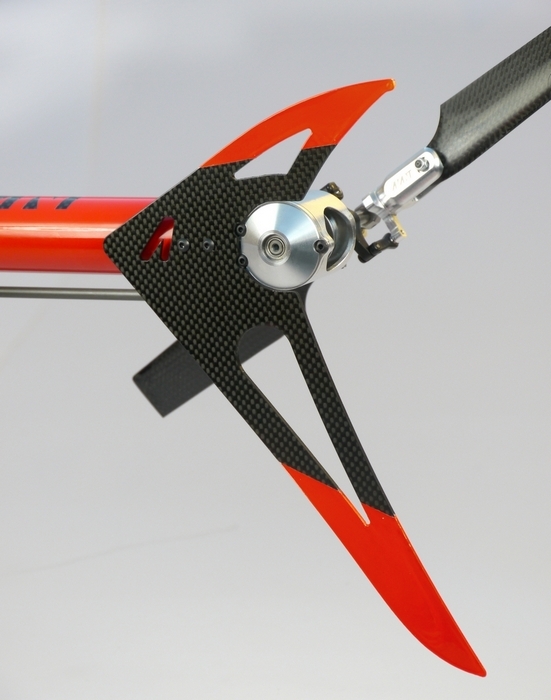 The Mostro uses tail blade grips with counterweights that lower the forces required by the tail servo to change the pitch. 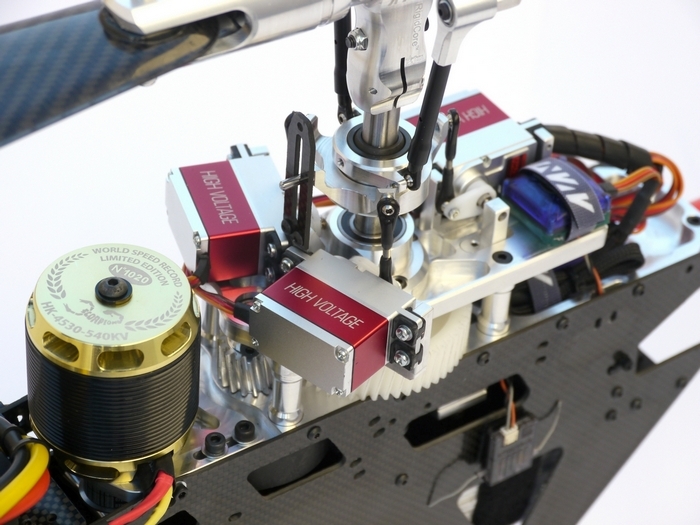 This lower force makes the movements faster and the servo works significantly cooler. Tail fin and left side of tail case. 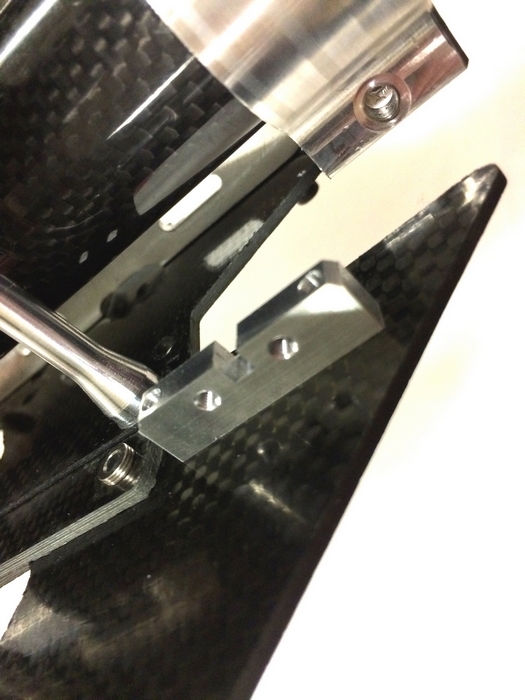 Top mechanics closeup showing servo arm pin screws. 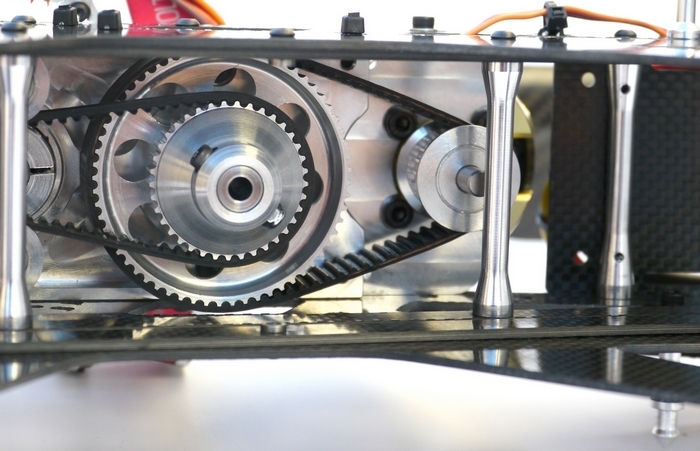 Beefed up high strength belt drive. 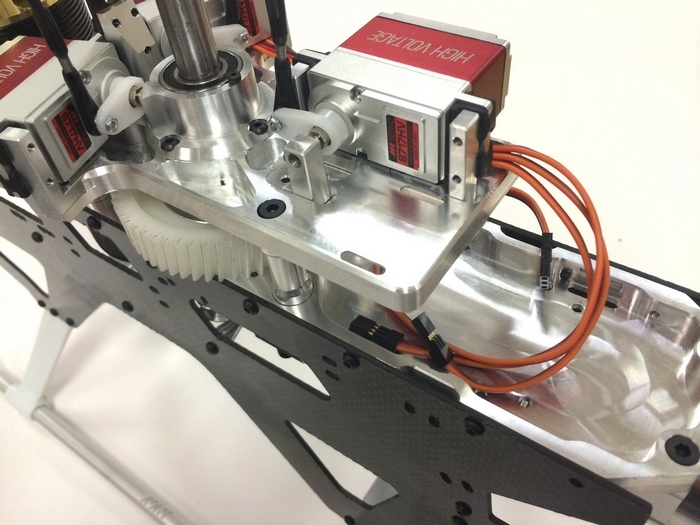 An Air Diverter Plate directs the airflow from the Naca Air inlets around the ESC an Motor for cooling efficiency and low drag. The Mostro Monoblock. This is truly a new approach that we are introducing in the market. being part of the system unless they needed dampening. 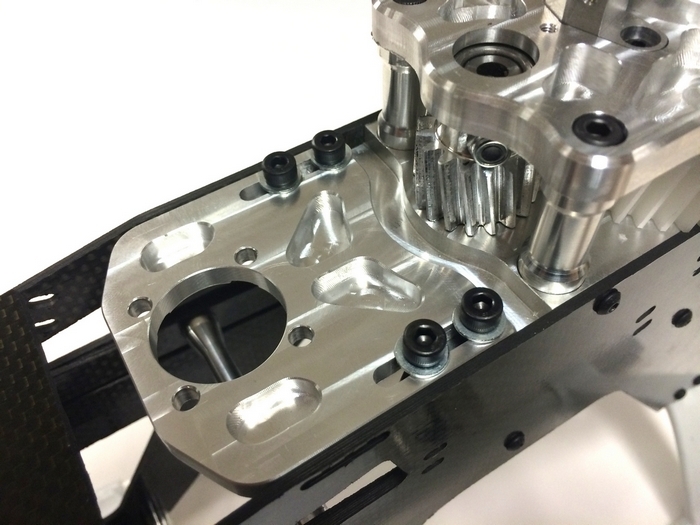 The result was the design of what we call the Mostro “Monoblock” ( single block). 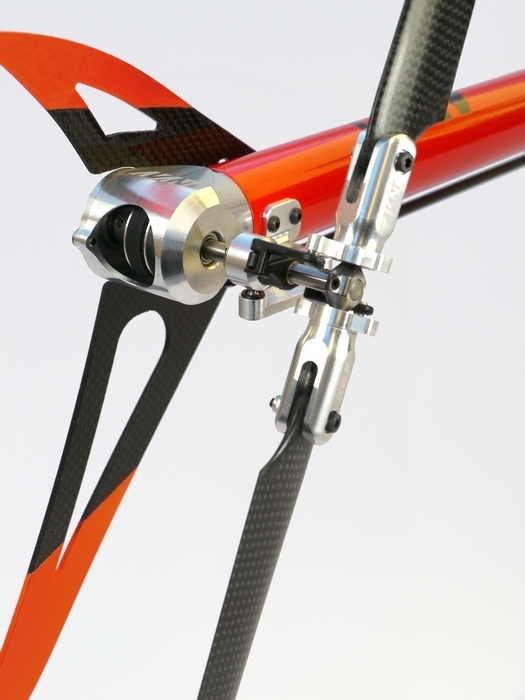 In the Monoblock design all elements of the system that affects the gyro sensing are mounted in a rigid superstructure. 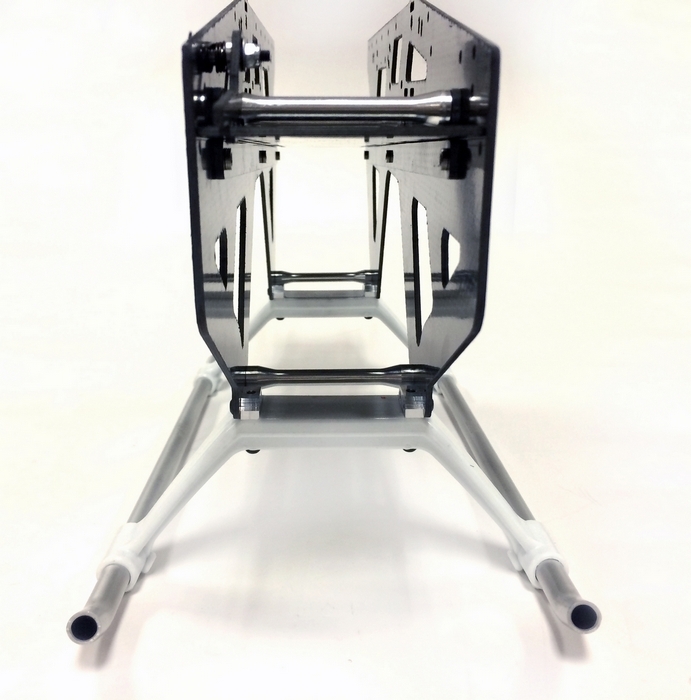 No part of it rests on the flexible frames unless it needs dampening. 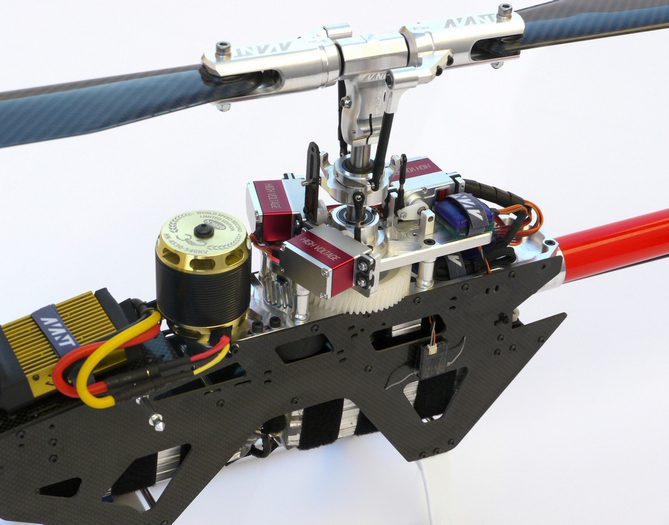 Wide contact area boom clamp and Tail Servo. 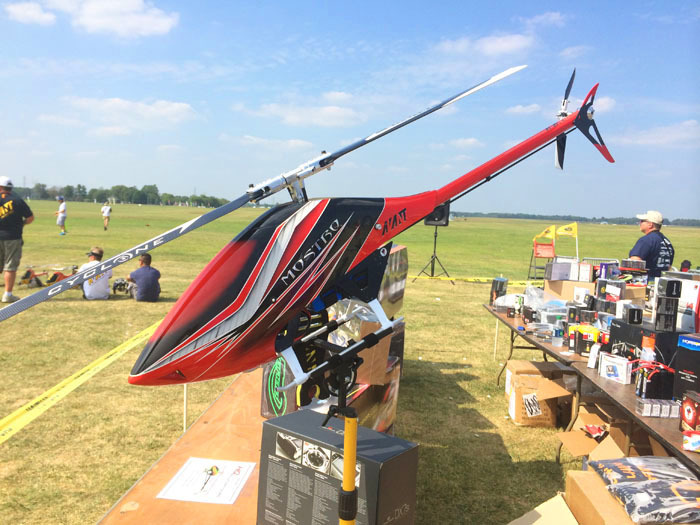 There’s a second one about 6 inches forward for very high boom rigidity. Yoke logos detail. 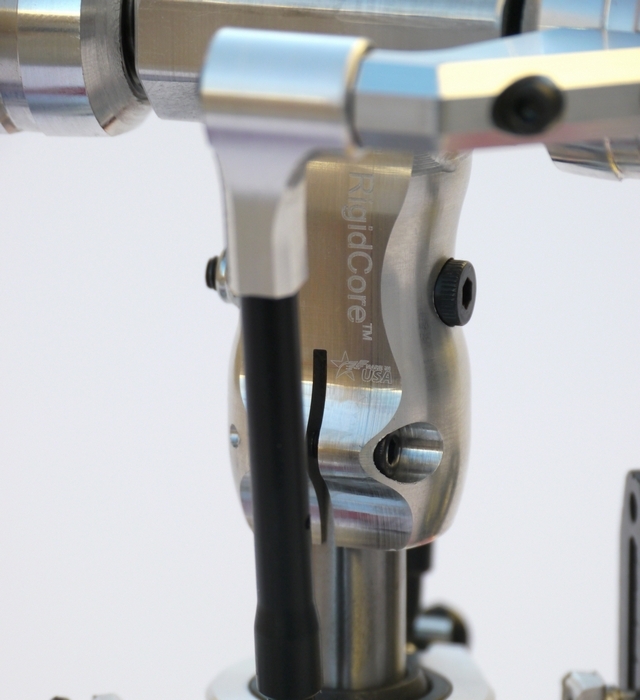 (Both DFC and Follower arm heads use the RigidCore dampening system). Here are a few pictures of interesting assemblies. 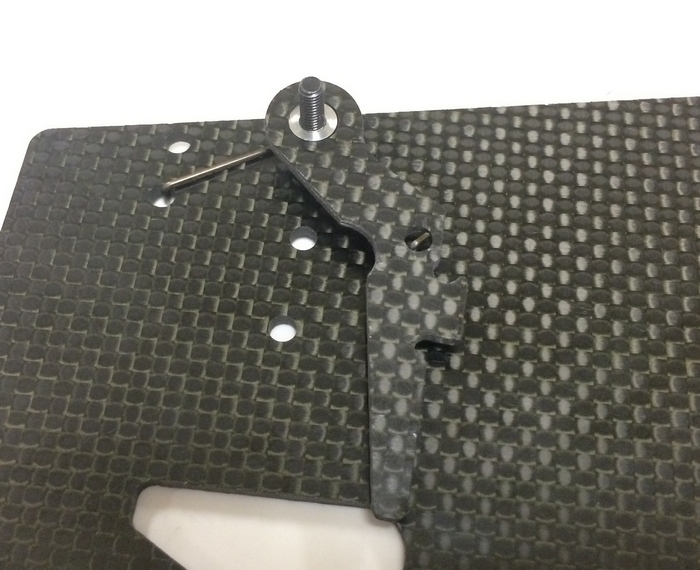 New Spring-Loaded locking bracket used in to lock the sliding battery plate in place. 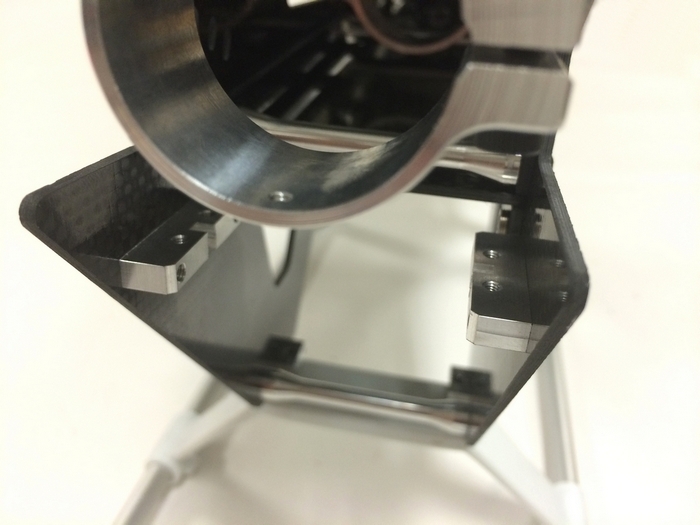 View of the Spring-Loaded locking bracket used in to lock the sliding battery plate in place. You can see it in motion in this video. 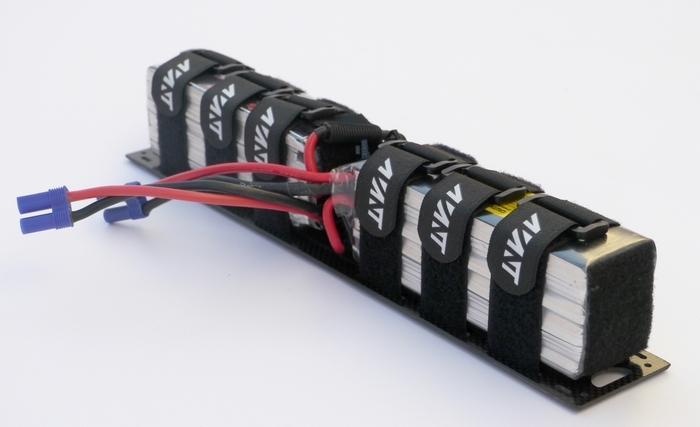 Very large capacity battery area for up to 8000mah packs. 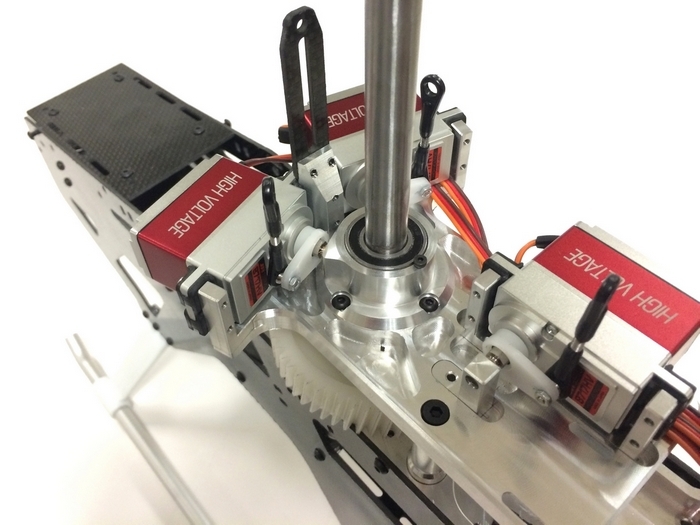 Servo with the support pin screw installed. 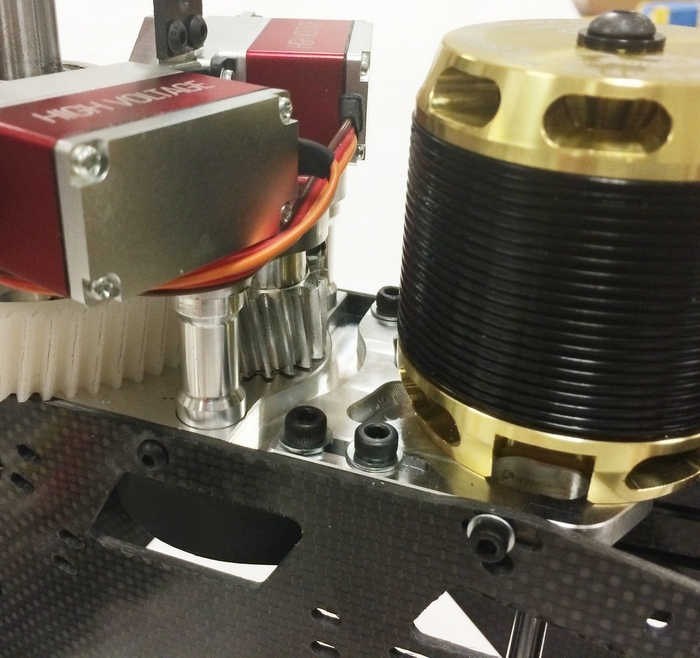 The kit comes with both for M3 JR/Spektrum servos and Futaba M2.5 servos. 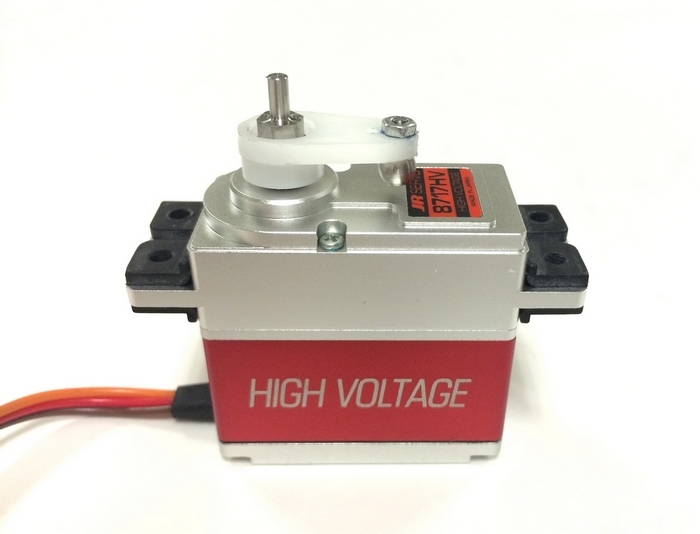 All other servo brands are included in those two standards. 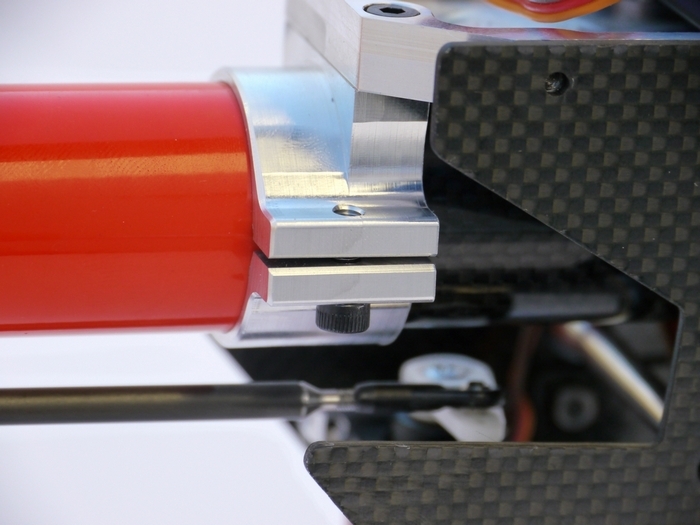 Servos with their support posts. 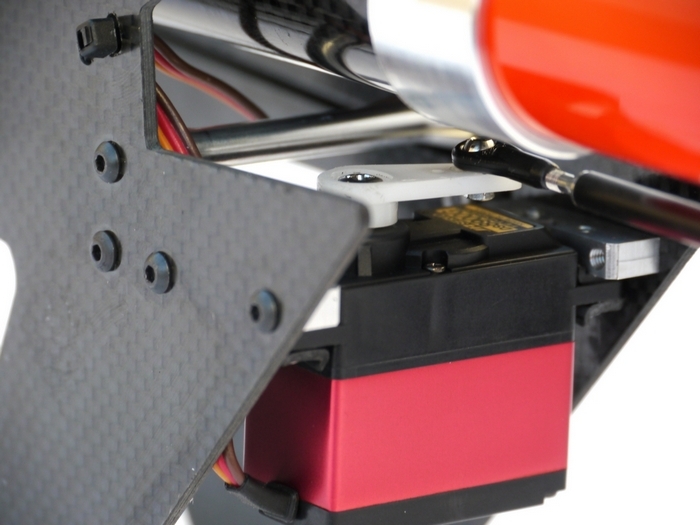 Servos with their support posts detail and radio trays area. 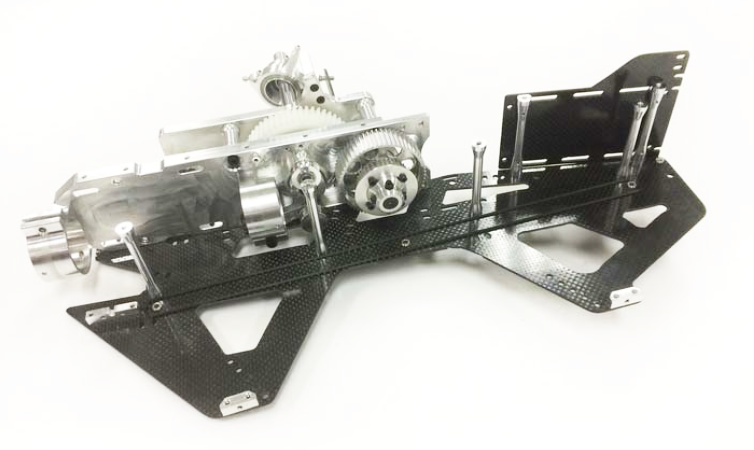 A lower plate with spring-loaded tensioner pulley and fixed idler pulley assembled. 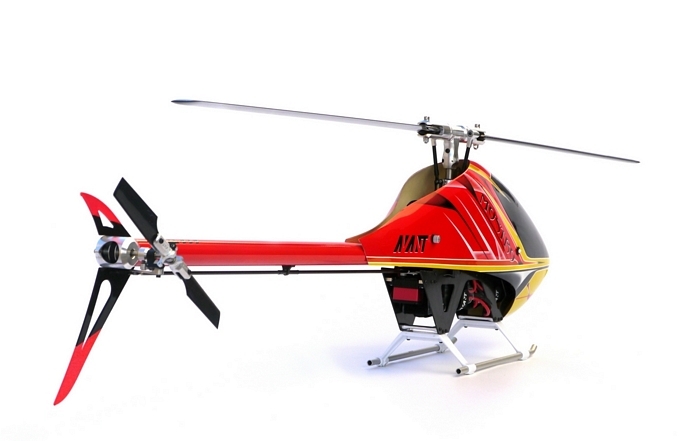 They can be assembled for clockwise and counterclockwise main rotor rotations. 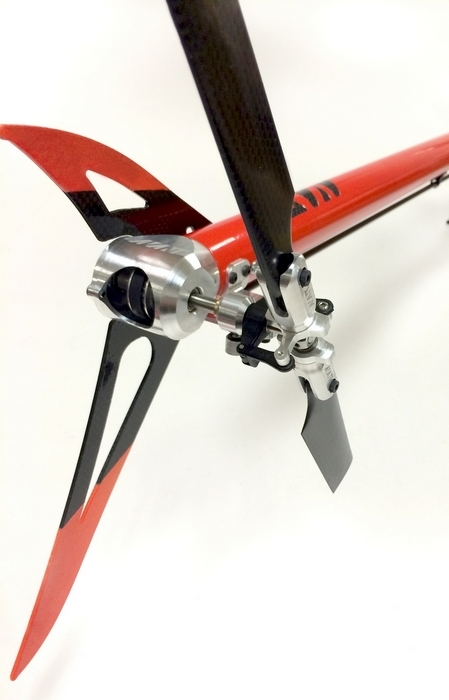 Landing gear is easily replaceable by removing two long screws. 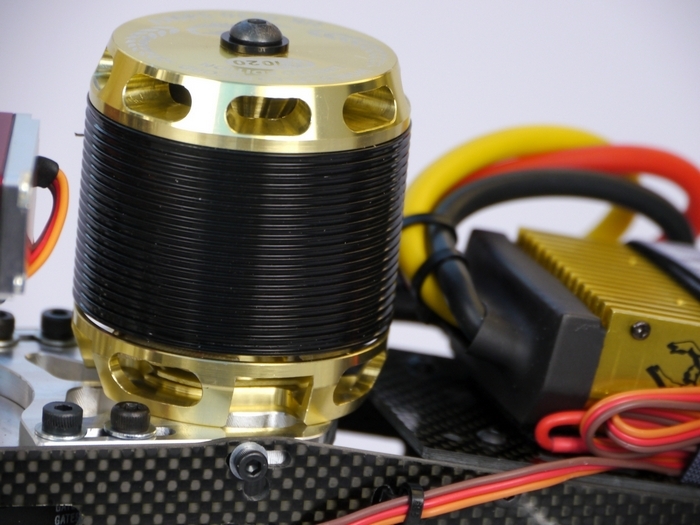 From flying prototypes and testing experience we have found the combination of the Kontronik Pyro 750-50 and the 750-56 depending on what head speed you’re looking for and the Kontronik Kosmik Cool 160 or 200 to be the best power combo we have tried on the Mostro for 12 cell configurations. 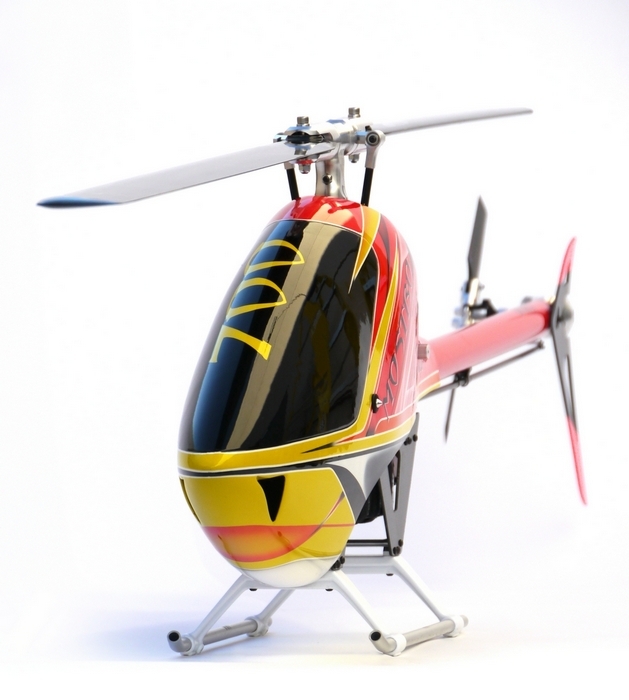 For applications where very high power is needed we have found that the Pyro 800-48 competition is a power monster. Other configurations and brands will also work great but these are the ones we have tons of experience on with fantastic results.